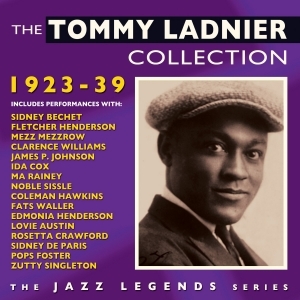 Tommy Ladnier was a trumpeter and cornetist who was active in the early years of jazz and recorded prolifically during the 1920s and early ‘30s and re-emerged after the depression years to make some very important recordings with the likes of Sidney Bechet and Mezz Mezzrow in the late ‘30s before his sudden and tragically early death in 1939 at the age of 39. A familiar figure on the early jazz scene in New Orleans, he moved to Chicago and recorded with many of the great female blues singers of the time, such as Ma Rainey and Ida Cox, as well as pianist Lovie Austin’s Blues Serenaders, before spending time in Europe. Back in the USA he was in Fletcher Henderson’s orchestra and Dixieland Stompers, and then with Noble Sissle’s orchestra in the early ‘30s after another stint in Europe, where he met Sidney Bechet. He teamed up with Bechet in the New Orleans Feetwarmers in 1932, and after a quiet time in the ‘30s re-emerged to record memorable sessions with Mezzrow, Bechet and other noted luminaries during 1938. Regarded as an exciting and powerful soloist as well as an excellent ensemble player, in some ways he provided a stylistic bridge between King Oliver and Louis Armstrong. This great-value 50-track 2-CD set draws from the 180 or more sides he recorded during his career, selecting material which provides a showcase for his often overlooked and under-estimated talent in the context of some of the best jazz of his time. 3 Basement Blues Noble Sissle & His Orch. 9 Revolutionary Blues Mezz Mezzrow & His Orch. 10 Comin' On With The Come On Mezz Mezzrow & His Orch. 11 Swingin' For Mezz Mezz Mezzrow & His Orch.